Arto Vaarala: "It's still possible to create plugins which enable new and innovative ways to create music." What's next from the innovative Kirnu? We chat to Arto Vaarala, the man behind the company's acclaimed Cream plugin. Tell us the story behind Kirnu. How did it begin? "The idea for 'Kirnu the arpeggiator' was born when I couldn't find an arpeggiator plugin I liked to use. All of them lacked some features or were hard to use. My dream had been for years to learn how to develop MIDI/audio plugins. Now I had a good reason to make it a reality. "As I was a hobbyist musician with many years of experience, and a programmer for over ten years, it was quite easy to get the hang of writing MIDI plugins. It took a few months to get into it - and a couple more to make something that was actually useful. "After releasing Kirnu 1, a guy named Lopez contacted me with additional feature ideas. Eventually, we sat down to implement these and other requests into a new plugin - and Cream was born! Lopez is a big part of Kirnu these days." Cream is a comprehensive MIDI plugin or, 'arpeggiator on steroids', as it's been dubbed. Why do we need a dedicated arpeggiator plugin when most DAWs and synths have their own? "Cream isn't just an ordinary MIDI arpeggiator plugin. It contains all the important features every arpeggiator should have - plus some smart and unique extras. At the same time, it's easy to use. "The concept behind Cream proves that it's still possible to create plugins which enable new and innovative ways to create music. It's not an easy task, but someone has to do it!" How's the response been to Cream? Which aspect of the plugin is the most vital, and what was the hardest thing to program? "We've mainly had positive responses, as well as numerous feature requests. We've always listened to our customers; we've implemented requests like the Chord Memory Trigger or the Send Only CC option. "I think the most important part of Cream is the SEQ tab, where you can create your own arpeggiator patterns easily. This is actually the last feature I added before Cream was released. "The hardest part was to make Cream run correctly in all DAWs, which we're nearly done with." 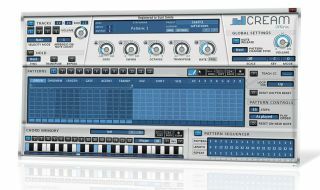 You were recently involved with the creation of a plugin-based editor/librarian for the Roland JP-8000 series synths. What benefits does it bring for hardware users? "Total recall, no more sticky notes to remember all the CCs for automation, and quick patch browsing without the limits of your hardware memory. Software is the future, but we don't have to leave those great-sounding synths behind." What's next from Kirnu? Any bright ideas? "The next big thing will be Cream Mobile - hopefully this year. It's an iPad application with an internal synth and drum track. "We're also going to release an Access Virus MIDI Editor/Librarian plugin, and there are plans for a MIDI performer application, which offers new ways to produce music, and up to seven new plugins."